About three years ago a working party descended on my QTH and we did some major upgrades to my VHF aerial system. We put up a longer pole, replaced the rotator with a bigger one, swapped all the cables out and fitted a masthead preamp. Everything worked well and I was happy with the installation except for one thing. When the wind blew, it creaked and it creaked badly. It was lessened slightly by guying everything firmly in place but it still creaked when the winds came up. I’d checked everything multiple times to ensure it was all tight but the creaking persisted. I put it down to the vastly increased weight on the mast, the bigger rotator, the longer stubmast, the Barenco bracket for the rotator and I just lived with it. Following the lightning strike last year, I took the whole VHF aerial system down and moved the 10m vertical from the back of the house to the front but once the weather turned, I noticed that it was still creaking. I didn’t really think much about this until today when the weather got worse and the wind kicked up and the creaking returned. 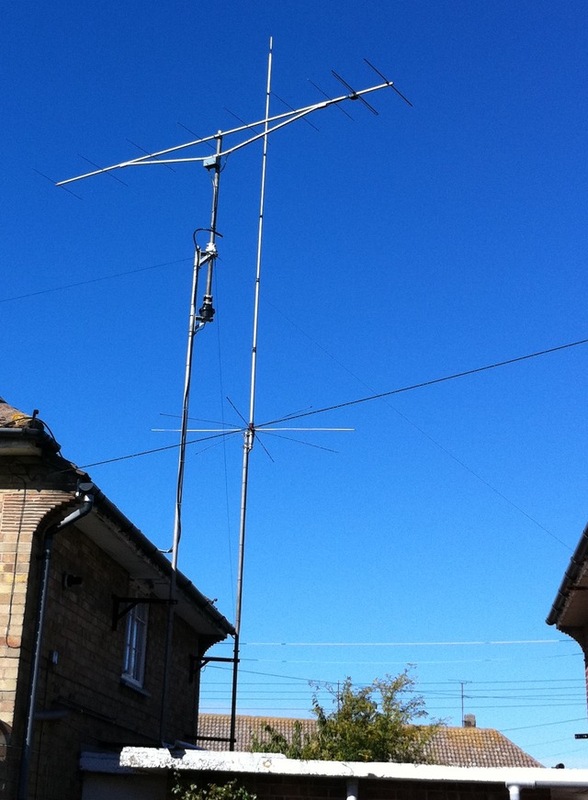 You can see my old 9 ele Vargarda in the foreground with the mast sitting on the flat roof – In the background is my old 10m 5/8 which has now been replaced by a Sirio Gain Master. The mast was touching the flat roof to take some of the vertical strain off the brackets, as you can see, there’s a lot of weight up that mast and it’s only supported by the three kevlar guys (which are rubbish by the way, they kept snapping). Tony suggested popping onto the roof and just lifting the mast a couple of inches so that it’s away from the flat roof. I did that today although I only raised it about half an inch from the roof and it instantly cured all the creaking problems. The pole only has the Sirio Gain Master on it now so there’s hardly any weight there. It seems really strange to be sitting in the shack now and hear the wind blowing strongly outside but not to hear a single creak coming from the mast. It’s lovely!